When the final buzzer sounded I felt a mix of emotions. Anger, sadness, melancholy, despair, any emotion with a negative connotation, I felt it. The strings of my heart were pulled and tugged in all the wrong ways. The Flyers fell to a 1-0 deficit just about seven minutes into the game. Sean Couturier took a tripping penalty and John Tavares made the Orange and Black pay the price. In the final minute of the period the Flyers took the momentum and Wayne Simmonds tied the game off a feed from Nolan Patrick by way of Oskar Lindblom. Unfortunately for the Flyers, this was all the action they would see offensively until the third period. Seriously, it’s like they were just going through the motions for the second period and it showed. The Flyers put six (!) shots on net in the second period. During that twenty minute span the Islanders potted three goals. One from Tavares, one from Mathew Barzal, and one from Anthony Beauvillier. The Isles took a 4-1 lead into the third period. The Flyers came out hot and drew a penalty less than three minutes into the period. Nolan Patrick potted a power play goal to cut the lead to two. The goal was assisted by Shayne Gostisbehere and Claude Giroux. The Flyers decided to go with the former. Four minutes later Nolan Patrick cut the Islanders lead to one on the power play. This time it was assisted by Jake Voracek and Shayne Gostisbehere. It was Patrick’s third point of the night. Five minutes after that, Claude Giroux got the game tying goal. It was assisted by Sean Couturier and Andrew MacDonald. This is the first time Claude scored 30 goals in a season, it’s also his 97th point of the season, good for third in the league. With the game tied at four with less than seven minutes to play, the Islanders regained the lead as Barzal scored the game winner on an odd-man rush. The Flyers couldn’t produce another goal and ultimately fell to the Isles 5-4. This is a tough loss to swallow. I understand that it’s hard to only play 40 minutes of hockey and expect to walk away with a win, but the Flyers literally had the Isles on the ropes. They brought themselves back into the game and were looking like world beaters only for Ivan Provorov to pinch on a play, the Isles to break out and leave Jori Lehtera trying to catch up to Barzal who potted the game winner. 1. Don’t blame it all on Mrazek. Despite letting up five goals, Petr Mrazek had a pretty good game. He made a lot of big saves to keep his team in the game. The first goal was hard to swallow as Tavares went five-hole on him. I feel like that’s one that you always want back. The only other goal that I would have liked to see him stop is Barzal’s first goal where he went short-side over Mrazek’s glove. This is also a case of the players in front of him not playing good defense as Barzal created a ton of space. Those two goals aside, Mrazek looked good. I know it’s hard to sell a five goal performance as “good” but the score is deceiving. It makes you wonder what Hakstol’s going to do for Thursday’s game against the Hurricanes. 2. Nolan Patrick is going to be a problem. The kid had three points tonight and single-handedly swung the momentum of the game in the third period. The first assist was beautiful. Oskar Lindblom took the zone and found Patrick. Patrick fed the puck to a wide open Simmonds who potted the Flyers first goal. Great read by the rook on that play. I said it earlier, but Patrick’s first goal of the game was an incredible effort. You could tell he was hungry and wanted to get that goal. The second goal was just as nice as the first. Nolan looked at home in front of the net on the power play unit. Nolan Patrick is really coming into his own and is showing fans why he was taken with the second overall pick. He’s finally completely healthy and playing with confidence. I don’t want to go all #RetweetArmageddon on everyone that thought Patrick was going to be a bust, but he’s incredible. 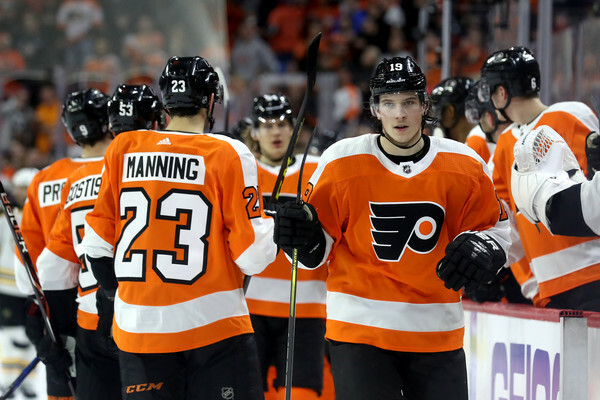 We’re going to look back at the Flyers climbing the 2017 lottery as a turning point in the franchise. Mark my words. 3. Is this the end of Wayne Simmonds? Short answer: In my opinion, yes. Long answer: I don’t want it to be, but I have a feeling the writing is on the wall for the Flyers alternate captain. He was usurped on the top power play unit by Nolan Patrick in Tuesday night’s game. When the Flyers went extra attacker at the end of regulation they sent out Claude Giroux, Jake Voracek, Sean Couturier, Travis Konecny, Shayne Gostisbehere, and Nolan Patrick. I’m trying not to read too deep into it and Hakstol might have been going with the hot hand for once, but I think the Flyers might be ready to move on from Simmer. He’s been hot and cold all season long, call it a nagging injury, call it his style of play finally catching up to him, but he hasn’t been the same player he’s been in the past. Back to the original question: I think Simmonds is going to get every opportunity to succeed in the last two games of the regular season, not to mention the playoffs. If Simmer can turn it around I think he will remain a Flyer. If he finishes the season cold I wouldn’t be shocked if he’s moved in the offseason. 4. Captain Claude: good at hockey. Claude Giroux added two more points in Tuesday night’s game to bring his season total to 97. This is the most any Flyer has scored in a season since John LeClair put up 97 in the 1996-1997 season. Giroux is now the sole owner of third place in points on the season behind Connor McDavid (103), and Nikita Kucherov (98). I say it after every game, but seriously, I’ll be shocked if Claude Giroux isn’t a Hart Trophy finalist. He is the most valuable member of any team in playoff position. Think about it: The Lightning would still be in playoff position even without Nikita Kucherov. They wouldn’t be nearly as good, but the Lightning are still a top three team in the Atlantic division without him. Evgeni Malkin? The Penguins still have a guy named Sidney Crosby. Would they be the same power house without Malkin? Probably not, but they’d still be a playoff team without him. If you take Claude Giroux off this Flyers team they fall to shambles and are one of, if not the worst team in the league. Someone needs to get that into the national pundit’s skulls soon. I’d hate to see Giroux not get the recognition he deserves after this phenomenal season. 5. The Flyers control their own destiny, to an extent. With two games left the Flyers need to earn three points. This can be done by winning one game and the Panthers losing one of their remaining three games. Or if the Flyers can win one game and take another game to overtime that would be just as good. This is good news, Flyers fans. Sure Tuesday night’s game was a heartbreaker, but the Flyers have games against the Hurricanes and Rangers left. I trust that the good guys will get the job done and find a spot in the post season. My ideal spot for the Flyers is to get the first wildcard spot. If the Flyers can get that spot and draw a matchup with the Capitals in the first round I think that would be the best thing for the team. I like how the Flyers match up with the Caps. Also, the Caps are notoriously bad in the playoffs. If they somehow find themselves in the third spot they will face the Penguins, not ideal. The Penguins have been hot lately and are always dangerous in the playoffs. I would rather see them in the second round after building momentum against the Caps. Arguably the worst possible scenario is falling to the second wildcard spot. While playoffs are better than no playoffs, taking on Boston or Tampa in a seven game series is a tall task. The Flyers control their own destiny to get to the playoffs. That said, they need to come out swinging and bury the Hurricanes on Thursday night at home.